This article is about Ivysaur's appearance in Super Smash Bros. Brawl. For other uses, see Ivysaur. For information about Ivysaur in regards to Pokémon Trainer, see Pokémon Trainer (SSBB), Squirtle (SSBB), and Charizard (SSBB). 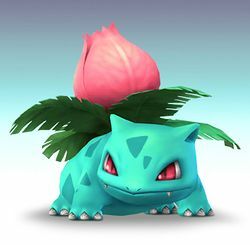 Ivysaur (フシギソウ, Fushigisou) is a playable character in Super Smash Bros. Brawl in a sense; it is one of three Pokémon that are played through Pokémon Trainer, the other two being Squirtle and Charizard. Ivysaur originated from the original Pokémon game for Game Boy as the first evolved form of Bulbasaur, one of the initial Pokémon the player can start out with at the beginning of the adventure. Ivysaur is perhaps the most difficult Pokémon to play out of the three. It cannot overpower its foes with deadly force like Charizard can, nor can it overwhelm foes with a high rate of attack like the nimble Squirtle. Furthermore, Ivysaur's major flaws prevent it from applying the same amount of pressure in a matchup as Pokémon Trainer's other Pokémon. KOing is one of Ivysaur's big problems. Ivysaur's two most KO-capable smashes are powerful but slow. Its forward smash deals high knockback, but has rather high startup and ending lag, while its up smash, despite being the strongest up smash in the game, suffers from high startup lag and a difficult-to-land hitbox that doesn't cover much horizontal distance. Ivysaur's forward aerial, its other vertical finisher, only begins to KO at around 130%. A sweetspotted Vine Whip can make for a superb surprise KO, but its diagonal trajectory makes it difficult to land, and leaves it helpless and vulnerable to punishment in midair. Ivysaur can pop off a dash attack for a quick and rather powerful headbutt KO, but the dashing animation makes the attack highly predictable and is easily blocked by shielding. Getting KOs is worsened by the Pokémon Trainer stamina trait, should Ivysaur get tired, decreasing the knockback on all of its attacks. Ivysaur's special moves are generally mediocre. Bullet Seed has the potential to deal upwards of 30% to an enemy, but to be knocked into the seeds, the opponent must be hit by a tiny hitbox on Ivysaur's sides at the start of the move, making it difficult to set up. The seeds are also easily SDI'ed out of, and the high ending lag leaves Ivysaur vulnerable to punishment if the move misses. Razor Leaf is Ivysaur's only ranged projectile, but its unpredictable flight path, low knockback, high startup and ending lag, and slow speed render it ineffective for purposes such as camping and harassing. Ivysaur is burdened with its weakness to fire-based knockback. While Squirtle is the only character in the game to do water-based knockback (discounting Mario with his F.L.U.D.D. ), there are many more characters than just Charizard who utilize fire-based knockback in their more powerful moves (R.O.B., Ike, Luigi, Snake, Mario, Captain Falcon, Mr. Game & Watch, etc. ), and have an easier time KO'ing Ivysaur as a result (one of the most notorious examples of this is Luigi with his Fire Jump Punch, who can KO Ivysaur at as low as 40%.) It also has quite a long rolling dodge animation, making it vulnerable to punishment by an opponent. Ivysaur's worst weaknesses, though, are its atrocious air game and recovery. Ivysaur has a tough time using aerials against opponents offensively, and is frequently at risk to being pushed to the edge while airborne. Its back aerial deals extremely low damage and poor knockback, and its neutral aerial has very short range and can easily be SDI'ed out of. His up and down aerial have small vertical hitboxes; combined with the fact that using these moves midair causes a change in Ivysaur's momentum, these moves are very difficult to land. While his up aerial delivers powerful vertical knockback, his down aerial is an extremely weak meteor smash that doesn't deal meaningful knockback until very high percents, making it generally ineffective as an edgeguarding tool. Ivysaur's best aerial, his forward aerial, only covers the area directly in front of it, leaving it with few meaningful options while in the air. Its poor aerials, combined with its very slow air speed, severely cripple its aerial game. Furthermore, Ivysaur's recovery is considered among the worst in Brawl. While its midair jump is decent, Ivysaur relies on its tether recovery, Vine Whip to return to the stage and this move can easily be edgehogged by opponents simply grabbing the ledge. This leaves Ivysaur with perhaps the shortest recovery in the game, and completely devastates its ability to recover safely from offstage, often dying to quick gimps; A launch offstage is usually enough to nearly guarantee a successful edgeguard on the Pokémon. It does have a good grab game, however; Ivysaur's vines give it one of the best pivot grabs along with Yoshi, and its running grab sports decent range as well (the standing grab, however, has surprisingly low range and a laggy "miss" animation). Once having grabbed, Ivysaur can use either a down or forward throw to maintain stage control. In summary, Ivysaur's difficulties KO'ing opponents, poor air game, laggy attacks, short reach, and atrocious recovery leave it as the clear runt of the litter among the three Generation I starter Pokémon. Competitive players argue that if Ivysaur was a standalone fighter, due to its lack of prominent strengths and debilitating flaws, it would be a contender for the worst character in the game, competing with bottom-tier characters such as Jigglypuff, Zelda, and Ganondorf. 3% Ivysaur whips a vine, then another, then extends the range for repeated vine slaps. 1-2% (hits 1-6), 2% (hit 7) Ivysaur leans forward and spins the leaves around the main bulb like a helicopter blade, hitting multiple times. 7% Ivysaur plants its vines on the ground and launches itself into the air. 2% (hit 1), 5% (hit 2) Ivysaur whips two vines quickly along the ground, hitting twice with good range. 12% (clean), 10% (late) Ivysaur slides along the ground, headbutting foes. 16% Ivysaur plants its vines on the ground and launches its body forward. Can be angled. 17% Ivysaur launches a burst of spores from its bulb. It is the strongest up smash in terms of knockback and has decent range. 8% Ivysaur quickly whips out vines across the ground simultaneously on both sides. Deals horribly low damage and knockback for a smash attack. Can cause opponents to sometimes trip. 2% (hits 1-7) Ivysaur spins while facing diagonally downwards. Hits multiple times with the last hit dealing minor knockback. The first 6 hits deal set knockback, which helps connect into the final hit. Has mild spike properties underneath its hind legs. 12% (vine), 10% (tip) Ivysaur slaps forward with a vine. Deals vertical knockback. 2% (hit 1), 3% (hit 2 tip), 2% (hit 2 base) Ivysaur spins around vertically and hits behind itself with two vines. Low damage with very low knockback, but has excellent range. 16% Ivysaur shoots a burst of gas out of the bulb with high knockback. The move causes Ivysaur to fast fall, which is often used for momentum cancelling. 10% (sourspot), 8% (sweetspot) Turns upside-down and shoots a burst of gas out of its bulb that's similar to its up aerial but deals slightly less knockback. There is a sweetspot at the bulb that meteor smashes opponents. Using the move halts Ivysaur's momentum in the air. — Stretches its vines and binds the opponent. 8% Grabs opponent with vines and tosses them forward. 10% Grabs opponents with vines, does a full spin, and tosses them back. 10% Grabs opponent with vines and bounces them into the air with the bud on its back. Good for Bullet Seed combos. 10% Grabs opponent with vines, does a flip, and smashes them to the ground. Good for follow-ups. 6% Get up with an horizontal spin, swinging its vines. 6% Gets up and hits both sides with its vines. 5% Stands up and hits both sides with its vines. 8% (vine), 6% (body) Climbs onto the edge and swings a vine. 10% Slowly gets up and headbutts onto the stage. Bullet Seed 4% (startup), 1-2% (seeds) Ivysaur sends a barrage of seeds ascending from its bulb. Can be used to rack up damage to opponents who are above Ivysaur. Razor Leaf 8% (clean), 6% (mid), 4% (late) Ivysaur shoots a large single leaf, which can hit multiple foes. The leaf can travel faster if the control stick is tapped. Air: 11% (sourspot), 13% (sweetspot) Ivysaur shoots a vine diagonally upwards, which works as a tether recovery. Ivysaur will gain a slight boost upwards when the move is used in the air. Pokémon Change 0% The Pokémon Trainer calls Ivysaur back by throwing a Poké Ball and then sends out Charizard. Triple Finish 1% (Solarbeam) The Pokémon Trainer sends out both Charizard and Squirtle and all three Pokémon perform a combination attack. The Pokémon Trainer releases Ivysaur from a Poké Ball and yells "Go Ivysaur!" Up taunt: Spins its bud, and shakes off some leaves. Side taunt: Stands on its front legs and walks around while saying "Saur, Ivysaur". Down taunt: Spins around and extends its vines doing a dance, it throws around some leaves while saying "Ivy, Ivy". Stomps from side to side. Looks around then shakes its body. The Trainer releases a Poké Ball and says "Go for it!". Note: The Pokémon Trainer says "Way to go, Ivysaur!" in all three victory poses. An excerpt from the main theme of the Pokémon series. It is shared with Pikachu, Jigglypuff, and Lucario. Up: Jumps and lands on its belly. Left: Stands in a battle-ready pose. Right: Pokémon Trainer pets it, and Ivysaur jumps on him, but Pokémon Trainer puts it down and continues to pet him. 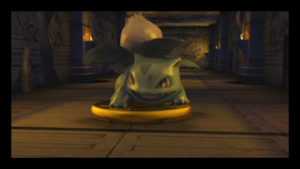 Ivysaur as a trophy in The Subspace Emissary. While in The Ruins, Lucas and Pokémon Trainer discover Ivysaur in trophy form at the end of a torch-lit hallway. Pokémon Trainer then throws a Poké Ball at the trophy to capture Ivysaur, adding it to his team alongside Squirtle. It is unknown why Ivysaur is a trophy, and why it is in the ruins. Note: Ivysaur is only featured in one event that does not include the Pokémon Trainer. Event 8: Go! Triple Finish! : The player controls Pikachu, who must defeat Squirtle, Ivysaur, and Charizard on Pokémon Stadium. Ivysaur's trophy is obtained by clearing Classic Mode with the Pokémon Trainer and must deliver the final hit to Master Hand with Ivysaur. A Seed Pokémon that is the evolved form of Bulbasaur. It has a flower bulb on its back, the weight of which has made it develop strong legs and hips. If the blossom gets too big, the Pokémon can't stand on two legs alone. At a certain level, it evolves into Venusaur. When this happens, the bulb absorbs nutrients and blossoms into a large-petaled flower. When Ivysaur moves, it sheds very small leaves, similar to Pit's feathers shedding when he jumps. Unlike other characters, when Ivysaur crouches repetitively, the animation doesn't completely finish; the bud on its back will stand up straight. If characters try to grab Ivysaur, they will be grabbing its bud even when grabbing in front of it. Ivysaur is one of the only characters who never uses any of its frontal limbs (or any of its limbs) for any attack (including grabs), the other being Yoshi (though Yoshi still uses items with his hands and throws eggs in his Egg Throw with his left hand). In The Subspace Emissary, Ivysaur is in trophy form in its only cutscene appearance. This makes it the only character that is not seen outside of their trophy form during cutscenes in this mode (not counting the credits). According to the Pokédex, Ivysaur is supposed to weigh a mere 28.7 pounds. Despite this, Ivysaur is one of the heavier characters in Brawl with a weight value of 100, which is as heavy as Lucario, a Pokémon that is supposed to weigh more than four times as much as Ivysaur. Unlike Charizard and Squirtle, none of Ivysaur's special moves are HMs in the Pokémon games. Pokémon Trainer's page at Smash Bros DOJO!! This page was last edited on March 1, 2019, at 21:51.